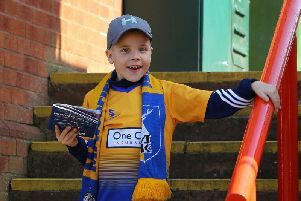 Although still only 23, I believe new signing Matt Preston’s valuable experience in Leagues One and Two is a real coup for Mansfield Town’s promotion ambitions. At his age, there is still potential to make him into a very good player. If he can keep himself fit and injury free as possible I believe he will be a good signing for us. Preston has become the first signing of the David Flitcroft era, coming from Swindon Town, who he had been managed by David Flitcroft at his old club. He had the chance to stay with Swindon with Phil Brown wanting to retain his services and offering him a three-year deal, but he opted instead to be reunited with his former gaffer. It is clear the majority of Swindon fans are disappointed that he has linked up with his old boss and not remained with them instead. Having beaten off attention of other clubs in the division, it speaks highly of him and we all wish him every success with us at Mansfield Town Football Club. Preston first started his career at Walsall, where he came through the youth ranks and quickly established himself as captain of his youth side, earning himself a professional contract with the Saddlers. From there he went out on loan to Icelandic side IBV to gain first team football, but unfortunately for him he didn’t get to go on the club’s pre-season tour and was sent back to Walsall. He then went on loan to Northern Premier League side Barwell, making 12 appearances and even managing to find himself on the scoresheet. He eventually make a first team appearance on 10th February as a sub to have a taste of League One football. The season afterwards his contract was not renewed and was subsequently left a free agent. Overall he made over 40 appearances for Walsall, scoring three goals. Following his release from his boyhood club, Preston signed for Swindon Town on a one year deal. His Swindon career got off to a great start, with the defender featuring a lot for the club, getting minutes and hoping to prove a few doubters wrong. However, disaster stuck when playing against Mansfield, in our 1-0 defeat, when he was forced off due to a serious knee injury, ruling him out for the remainder of the season.